You want to eat more healthfully, you just have this one limiting factor, you don't cook...or you don't want to cook. Who has the time anyway? It's just so much easier to order take out, go out to a restaurant or hit the drive-through. Right? Not so fast. Eating healthfully doesn't have to be complicated or time-consuming. I get it. 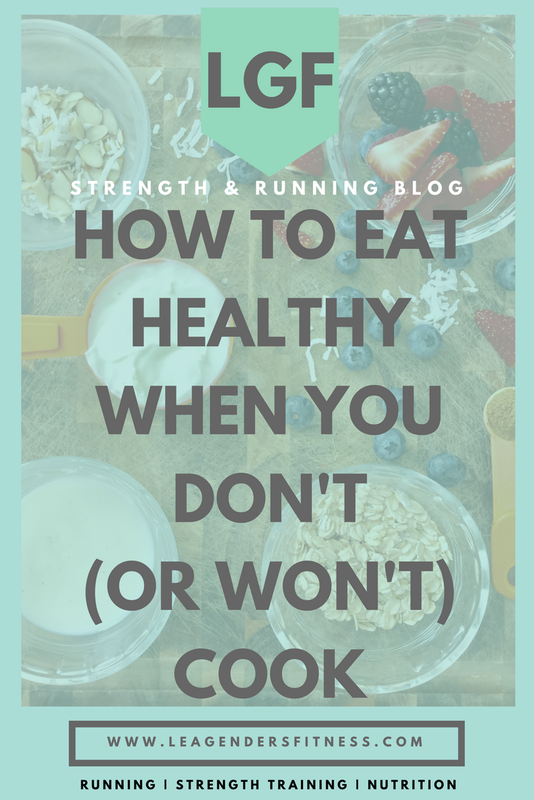 Unless you have your own personal chef or are married to one (or a wannabe one, like me) then preparing healthy meals can seem like a huge undertaking. I am not a cook. My husband likes to joke that I could burn cereal. He thinks that since I am part-Italian I should have inherited amazing cooking skills passed down genetically from the generations. Not so much. It's not unusual that I call my more domesticated-skilled sister and ask her a random cooking question that leaves her laughing on the floor. "What does it mean when the recipe says to ...."
I'm no cook, but I learned how to get around my handicap years ago. You can eat healthfully, even when you don't know how or want to know how to cook. It doesn't even take a lot of time, just a little planning. If you stick to the basics, you can eat healthfully, even when you don't (or won't) cook. I used to have a friend who would go all-out and make these extravagant healthy meals for her family that would take hours to prepare, but when she didn't have the time or energy to prepare those meals, she would resort to ordering pizza because it was easy. It's fine to have an occasional indulgent meal, but there is no need to use time or energy as an excuse to eat unhealthy foods. There are plenty of choices in-between that extravagantly prepared healthy meal and pizza delivery. It's not a choice between eating perfectly or terribly, we have a lot of healthy, easy to prepare choices in the middle. Meal prep is a great way for people who don't have a lot of time to prepare their meals for the week. When you put in the effort upfront, it is easier to make a healthy decision during the week. I know what you are thinking. "Lea, I just told you I don't cook and now you're telling me to meal prep? What part of 'I don't cook' didn't you understand?" Hear me out. If you make your food upfront you only have to cook once and you're set for the week. Bake your lean protein in bulk. I buy two pounds of chicken at a time and bake it in the oven (at 350 for 30-35 minutes, add dab of butter so they don't dry out) or I ask hubs to cook on the outdoor grill. Freeze the leftovers. You can add cooked chicken to salads, to whole wheat wraps or pair with a side of healthy carbs or vegetables. Cook your chicken in advance then prepare and serve it different ways to avoid boredom (see below for ideas). I don't watch 'This is Us' but even I heard about the Crock-Pot story. Don't throw away your Crock-Pot just yet. Slow cookers are an easy way to meal prep because you add lean meat (healthy. check.) and veggies (healthy. check.) in a pot, turn it on, walk away and it cooks all by itself. A quick Pinterest search will give you tons on recipes (i.e. ingredients to add to the slow cooker). Make more than you need and freeze the leftovers for a quick meal for the future. Buy a fully-cooked rotisserie chicken from the grocery store for already prepared protein to add to your meals. No cooking required. My friend at work gave me this idea. She buys her cooked meats from buffets and salad bars from stores like Whole Foods or Central Market. If you don't want to or don't have time to cook it is a quick (albeit, more expensive) way to grab some healthy protein for your meals. OK, fine. You really don't want to do anything that even resembles cooking. Frozen foods from the grocery store may be the answer. Make sure you check the ingredient list that there are not a lot of added ingredients and preservatives, but food manufacturers are making frozen food more natural now due to customer demand! Don't trust the packaging marketing though, the words "all-natural" on the front of the package means next-to-nothing. Read the ingredient list on the back of the package and choose products with just a few ingredients that you can recognize. Again, it's not all-or-nothing, a frozen meal is still usually a healthier option than a fast food meal. We are not striving for perfection, just better. Frozen vegetables are picked at their peak ripeness and are just as healthy as fresh. Buy the microwavable steamable veggies for a quick and healthy side dish. Don't be afraid to add seasonings, butter or cheese for flavor. Remember it's not a choice between steamed no-flavored vegetables or no vegetables at all. Eat your veggies. How can you make it work for you? I buy all-natural frozen turkey or chicken patties that can be cooked on a frying pan in 8-15 minutes, no actual cooking skills required. You can also buy the precooked chicken breasts that just need to be defrosted. The good news is that you don't have to cook in order to eat one of the healthiest meals out there, salads! Chop a variety of colorful veggies and add to spinach leaves for a nutrient-dense meal. If you really don't want to cook you can have healthy meals delivered or make meal prep easy by using one of those services that send all the ingredients and the recipe card for an easy to follow dinner with no grocery shopping required, like Hello Fresh or Blue Apron. These may be a little more expensive, but a great choice for people who are just too busy to research and shop for their own meals. Eggs can be cooked on a frying pan in just a few minutes, hard-boiled in 12 minutes or microwaved (make sure you completely break up the yolk to avoid an egg-plosion before microwaving) in about a minute. Protein shakes are an easy option when you don't have time to cook. Add protein powder, fruits and veggies (try spinach!) to a blender for a quick and healthy breakfast on the go, here are some protein shake ideas from my Running with Ollie blog. Old-fashioned oatmeal can be cooked on the stove top or in the microwave. Buy the plain old-fashioned oatmeal in the canister and add fruit, berries and/or cinnamon for natural flavoring. You can prep delicious oatmeal in advance with overnight oats. Whole wheat wraps with prepared chicken or pouch tuna. Add chicken to fresh spinach and chopped veggies for a delicious salad. Premake salads for the week in mason jars for a quick healthy lunch on the go. Use a whole wheat pita as a pizza crust, add sauce, cheese, chicken and load up with veggies for a healthier pizza lunch. Frozen turkey burgers cooked and served on a whole-wheat flat bun is a delicious high-protein healthy meal in about 10 minutes. Add chicken to brown rice, vegetables, cheese and salsa for a mexican-style burrito bowl. You can buy microwavable brown rice for a quick meal. Add low-sugar red pasta sauce to chicken for an Italian-style meal. Try a (affiliate link-->) spiralizer to make noodles out of vegetables (no cooking skills required!). Add chicken to a big bowl of fresh spinach and colorful chopped veggies for a delicious nutrient-dense meal. Cottage cheese, plain Greek yogurt (flavored with fresh fruit or berries), nuts, seeds and fruits all make quick and healthy snacks. The key thing to remember is that healthy cooking (and healthy living in general) is not all-or-nothing. Do the best you can what is reasonably available to you in the moment. You don't have to eat or cook perfectly to see results. Be mindful of your choices and try to choose 'just a little bit better' and you'll do fine overall. The choice is never just between the perfect healthiest choice or the nutritionally worst choice possible, there are a whole lot of options in the middle. Be mindful. Do the best you can and it will always be enough. When you mess up (we all do, we're human after all) pick back up and try again at your next meal. Need help with nutrition? Tired of diet plans that fail? Want to work from the ground up building nutrition habits that change the way you view food for sustainable results? My nutrition habits coaching program is for people who are tired of dieting and just want to learn to eat healthy. It's a year-long curriculum to change your habits from the inside out. No long term payment commitments required, just a commitment from you to give it your best effort. Try it for the first month at 75% off to see if it is a good fit for you. Cancel anytime, hassle-free. Questions? I'd love to help. Like this post? Do you know one person who could benefit from reading it? It helps me grow when share with your friends and followers.